Globally, somewhere between 7 and 12 per 100,000 of population will be murdered every year (excluding deaths by “war” or war-like armed conflicts). 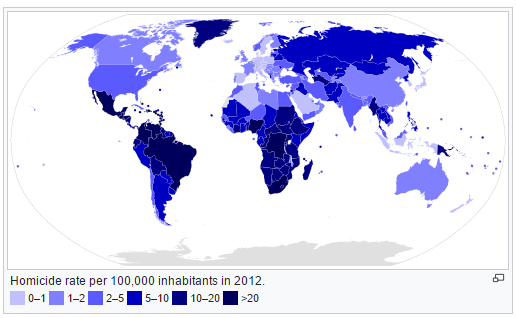 This number varies widely between less than 1 per 100,000 in many countries but up to 90 per 100,000 in Central America. Between 500,000 and 900,000 people will thus be murdered every year. Assume that 750,000 are murdered and with an assumed kill-rate of 1.5 the world will produce 500,000 killers in a year. Some of them though will be repeat killers. Again, assume that 80% are “fresh” killers. That would give a global production of 400,000 fresh killers every year. In 2015, the world saw around 3,500 executions (not all for murder and over 2,000 estimated just in China). In any case, executions contributed very little to reducing the number of killers living. I further assume that the killers have a somewhat reduced longevity with an average of – say – 65 years. It follows that we have 26 million murderers living among us – which is 0.37% of the global population (370 per 100,000 of population). But another way of looking at the numbers is that in every 100,000 of population there are 370 killers present. Seven – twelve of the population will be murdered every year. Five to six new killers will emerge. Or that any “globally representative” gathering of just 270 people will probably include one killer. (I just observe that the US Congress has 435 voting members, the UK House of Commons contains 650 members and the Swedish Riksdag has 349). This entry was posted on April 3, 2017 at 9:06 am and is filed under Behaviour. You can follow any responses to this entry through the RSS 2.0 feed. Both comments and pings are currently closed.